When I was a young girl, I was a consummate entrepreneur. I sold food (scary, if I you tasted my cooking), lemonade, clothing -- heck, I even sold my sister’s stuffed animals back to her (that’s another story). All that said, I would have loved a book to develop my growing business mind. Clearly, I am not the only one. My good friend JJ Ramberg is the host of the entrepreneurship show Your Business on MSNBC, notably the second longest-running program on the network. She's also an entrepreneur in her own right as founder of the twelve-year-old coupon site Goodshop. Having three kids (currently aged seven, eight, and nine) who are naturally interested in starting a business, she went to the bookstore to find a fun book about kids who start businesses and found nothing. 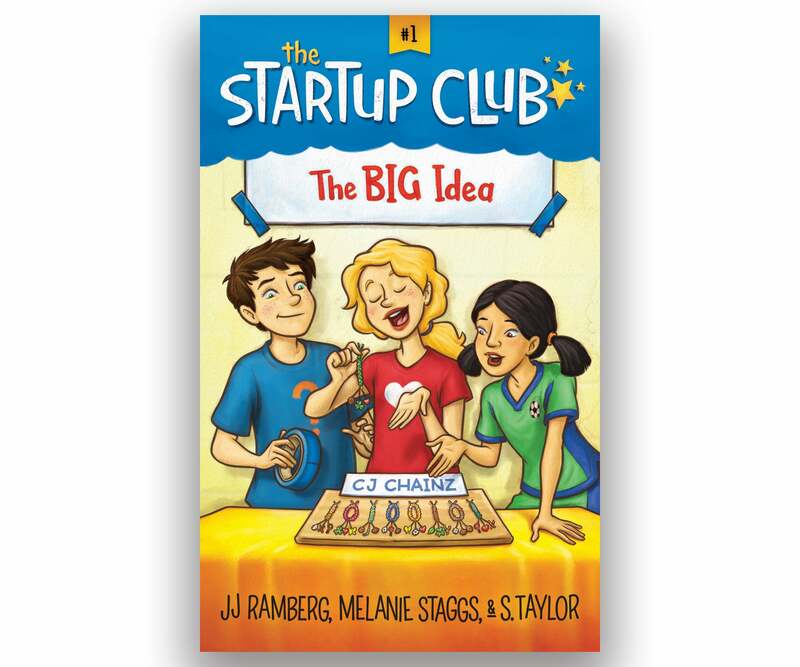 So, as any good entrepreneur would, she decided to solve her problem and write one of her own, The Startup Club: The Big Idea. I talked to Ramberg about the book, her process and what kids can learn from it. Why did you decide to write The Startup Club? Ramberg: Kids are natural entrepreneurs. Just the other day, my two boys (eight and nine) were at MSNBC and earned $30 selling the makeup team stress paper from the company that they started with their friends, which they call American X-Stress. As another example, my good friend Linda's then nine-year-old twins asked for a Square payment card reader for their holiday present a couple of years ago so they could take credit cards to sell their homemade bracelets! However, while so many of these kids have lemonade stands and bracelet business and carwashes, they don't understand that revenue is not profit. I thought that we were missing a real opportunity to take something that kids are already engaged in and turn it into a teaching moment. Before I go on, I have to ask, what is "stress paper?" Basically, it's paper covered in tape that you can't rip. So, if you're really stressed out, you can get your energy out on it. If you're interested in buying some, I can get you a deal [laughs]! Why did you make it fiction instead of an entrepreneurial "how to?" We wanted this book to be fun, so instead of beating the kids over the head with "lessons learned,” we wanted to create characters that readers would use as an example. I gave an early copy of the book to the founders of "American X-Stress" and I later heard them referring to the book when they were trying to decide how to divide the profits. The idea is that kids are engaged as they would be with any good children’s book, but are inspired and learn a lot along the way. Why is it important to teach kids business lessons at an early age? To me, this is as important as math and social studies and science. Money is a part of our everyday lives. The more we can do to get our kids comfortable with the basics of financial literacy at an early age, the better chance they have of avoiding financial issues like extreme debt later in life. We are using entrepreneurship as a way to get kids to start this conversation. In addition, the work world is different than it was 30 years ago. To succeed in their careers, I believe all our kids will need to have an entrepreneurial attitude, even if they are working for a large company. Warren Buffett is quoted as saying, "There was a study many years ago questioning how to predict business success later in life. The answer to the study was the age you started your first business impacted how successful you were later in life. Teaching kids sound financial habits at an early age gives all kids the opportunity to be successful when they are an adult." I've actually not been able to find the study, but I absolutely believe in the spirit of the quote. Did you have a business as a kid? My childhood friend Shelly Zimmerman and I sold lemonade at our brothers' little league games when we were in grammar school. Shelly now has a big job in Hollywood, so I'd say that the lemonade stand served her well later in life. If there is one takeaway that you hope kids (young or old) learn from this book, what would it be? I want kids to come away from this book inspired. If they have an idea to start a company, they should go for it – but remember, if you buy any supplies, you have to pay your parents back for them! For more from JJ, check out her Facebook list list Live Chat with Entrepreneur.